WALTHAM, Massachusetts -- No question about it� they're very good at what they do. But they don't take well to orders, especially those to carry out inspection work in oily or dangerous environments, or in any kind of harsh environment, for that matter. Still, they're one of the fastest and most maneuverable creatures on the planet, having extraordinary abilities at both high and low speeds due to their streamlined bodies and a finely tuned muscular/sensory/control system. This impressive creature is the humble tuna fish. The Department of Homeland Security's (DHS) Science and Technology Directorate (S&T) is funding the development of an unmanned underwater vehicle designed to resemble a tuna, called the BIOSwimmer�. Why the tuna? 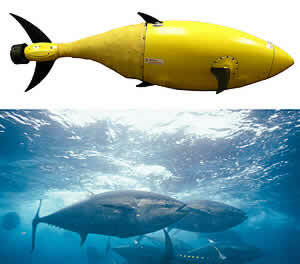 Because the tuna has a natural body framework ideal for unmanned underwater vehicles (UUVs), solving some of the propulsion and maneuverability problems that plague conventional UUVs. Inspired by the real tuna, BIOSwimmer� is a UUV designed for high maneuverability in harsh environments, with a flexible aft section and appropriately placed sets of pectoral and other fins. For those cluttered and hard-to-reach underwater places where inspection is necessary, the tuna-inspired frame is an optimal design. It can inspect the interior voids of ships such as flooded bilges and tanks, and hard to reach external areas such as steerage, propulsion and sea chests. It can also inspect and protect harbors and piers, perform area searches and carry out other security missions. Boston Engineering Corporation's Advanced Systems Group (ASG) in Waltham, Massachusetts, is developing the BIOSwimmer� for Homeland Security's Science and Technology Directorate. "It's designed to support a variety of tactical missions and with its interchangeable sensor payloads and reconfigurable Operator Controls, and can be optimized on a per-mission basis," says the Director of ASG, Mike Rufo. "It's all about distilling the science," says David Taylor, program manager for the BIOSwimmer� in S&T's Borders and Maritime Security Division. "It's called 'biomimetics.' We're using nature as a basis for design and engineering a system that works exceedingly well. Tuna have had millions of years to develop their ability to move in the water with astounding efficiency. Hopefully we won't take that long." Wow/ Now we need one that can reproduce. Aren't Tuna endangered or close to it? If this doesn't prove we are wasting WAY too much money on "Homeland Security," nothing ever will. Reign in this spending and balance the budget! are you kidding me, what a waste of money. hope they can be used for udt services. it would sure help the spec forces.